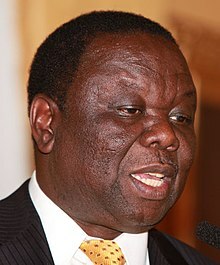 Morgan Richard Tsvangirai (/ˈtʃæŋɡɪraɪ/; 10 March 1952 – 14 February 2018) was a Zimbabwean politician. He was Prime Minister of Zimbabwe from 2009 to 2013. He was President of the Movement for Democratic Change – Tsvangirai (MDC-T) and a key figure in the opposition to former President Robert Mugabe. Tsvangirai died on 14 February 2018 at a hospital in Johannesburg, South Africa from colorectal cancer at the age of 65. ↑ "Mugabe appoints ZANU-PF lawyer as Zimbabwe finance minister". Reuters. 10 September 2013. Archived from the original on 27 September 2013. This page was last changed on 6 July 2018, at 17:56.